The Journals of the Lewis and Clark expedition contain references to some two dozen occasions when men turned to music for recreation. 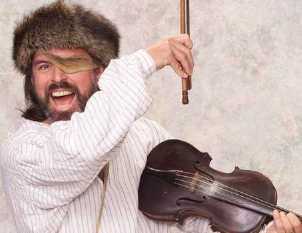 Pierre Cruzatte often entertained the explorers with his exuberant fiddle-playing, keeping spirits high during non-work periods. Music served as a critical survival tool, both as a form of entertainment and recreation for the members of the expedition; and as a way of establishing trust and good will with the Indian nations encountered along the trail. December 25, 1804- Christmas Day Fort Mandan: "We fired the swivels at day break & each man fired on round. We had the best to eat that could be had, & continued firing dancing & frolicking during the whole day. We enjoyed a mery christmas dureing the day & evening until nine oclock - all in peace and quietness." October 24, 1805 - Camping at Wishram - Wasco Village near present day Horsethief Lake State Park, WA: " Peter Crusat played on the violin and the men danced with delighted the natives."